This is still a work in progress, but it’s a visual update of my post a few weeks back about the Good Tutor Profile that we’re going to start promoting. We’re trying to address this question: How do you spot quality assured tutors who possess the baseline knowledge and skills required for embedding literacy and numeracy into their trade? 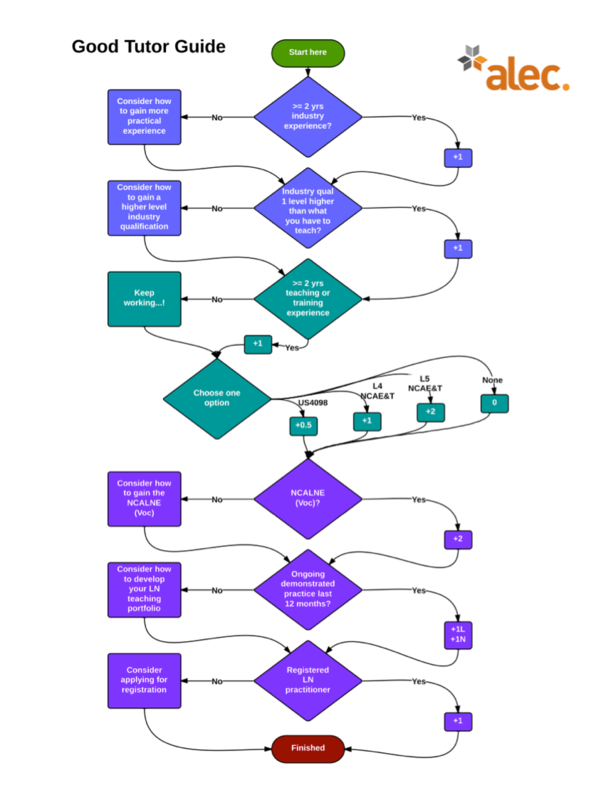 The basic idea with the flowchart is that you could evaluate good tutors by awarding a series of points for each of the aspects of the ALEC good tutor guide. See the right hand side for that. Also, by implication, this system suggests a particular professional development pathway where some aspect of the good tutor profile is missing. What do you think..? I think it’s genius… Let me know in the comments.